GoDaddy is one of my favorite domain name registrars and I have been using their service for the past five years. They offer low-cost domain name registration for the first year with a rate not many other registrars cannot offer. I have been using this privilege ( like 108 Indian rupees for a .com domain ) to register names for my projects but recently I faced an issue while placing the order. The system is not letting me complete the transaction. At first, I thought it is a common bug but sooner I discovered the true nature of it. Whenever I use GoDaddy promotion code to cut down the price, the system shows error. Whenever I click on Place Your Order button, it responded with the following message. There is a problem with the information you provided. Please ensure all fields are completed properly. So many thoughts went through my mind after seeing this alert. I checked this situation without using their promotional code and that time everything was fine. There was no error message while clicking the Place Your Order button when I was ready to pay the full price. I confirmed the situation with my friends and they said that whenever they continued the shopping without applying coupon codes, there was no error while placing the order. Whenever they used coupon code to get a reduced rate, the same issue appeared. I was in the impression that 108 Indian rupee for a new domain name from GoDaddy is just a marketing gimmick to attract users and they do want us to pay the full amount once the order is about to complete. However, I was wrong and I knew it while talking with their customer support. 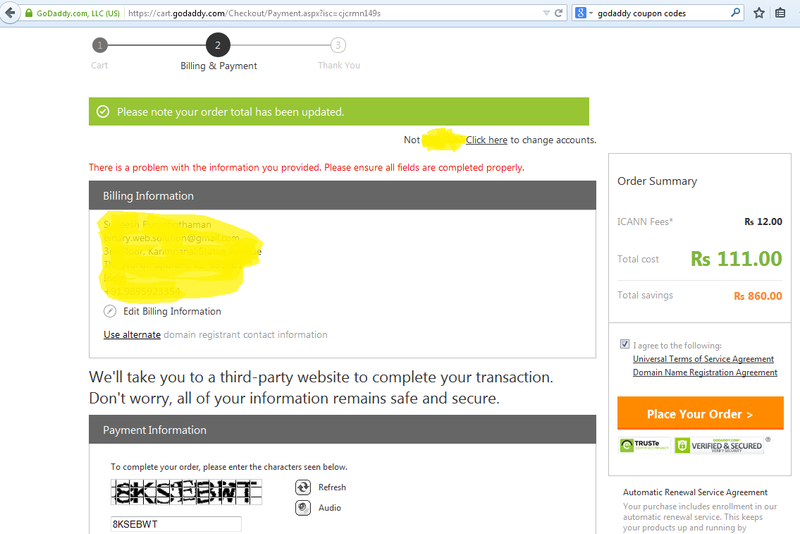 We can solve the GoDaddy billing error There is a problem with the information you provided. Please ensure all fields are completed properly. by following a simple step. The above-mentioned error code appears only when a user uses coupon code to cut down the price of the product he purchased. It is because the coupon code he used is applicable only for USA and Canada customers. So if you are from a different country, you are not authorized to use them. However, GoDaddy doesn't discriminate people on the base of their logon IP location. So if one user changed his default currency from his local currency to US or Canadian Dollar, this error message will not appear. This facility only works for those users, whose cards support payment in US or Canadian Dollar. I have changed my default currency from Indian Rupee to USA Dollar and the error message disappeared. If you do not know how to change the default currency set on a GoDaddy account, follow the steps below. To know more about it, I recommend you to visit the link below.